This scenic canyon received its name from John Wesley Powell during his historic descent of the Green and Colorado Rivers in 1869 and 1871. Red rock canyon walls and a verdant ribbon of riverside foliage define this stretch of river as it divides the Tavaputs Plateau. Desolation Canyon is far from desolate, with its Cottonwood tree groves, big sandy beaches, eagles and bighorn sheep. Inside the canyon walls, you will find the remnants of past visitors, from ancient rock art and stone ruins left behind by the Fremont Indians, to a cabin abandoned by early settlers. This 84-mile stretch of river boasts more than 50 splashy Class II-III rapids along with peaceful stretches, perfect for contemplation, paddling an inflatable kayak, or trying out a stand up paddleboard, making it an entertaining choice for travelers of all ages and experience levels. We’ll meet at 7:00 PM at The Gonzo Inn, 100 W 200 S, Moab, Utah, for a pre-trip meeting. At the meeting you will have the opportunity to meet your fellow travelers and trip leader and ask any last-minute questions. Your trip leader will give you a thorough trip orientation, and pass out your waterproof river bags so that you can pack your belongings that evening. We begin our trip with a scenic flight from Moab to our put-in at Sand Wash where you will have the opportunity to get a bird’s eye view of the desert landscape. We will meet at around 6:00am to catch our flights and due to the challenges of finding places to eat in Moab, we will offer a simple continental breakfast at the warehouse. After a thrilling flight, we will begin our descent to the Green River. Wear your hiking shoes today as we will hike 1.5 miles down into the canyon, where our boats are waiting. OARS crew will transport all gear in vehicles, so guides and gear will be ready to take off upon our arrival at the river’s edge. Following a thorough safety talk we will board the rafts and begin our journey. At lunchtime we pull over to a sandy beach and enjoy a delicious picnic. After feasting and enjoying the beach, we get back in our boats and watch the desert panoramas slowly develop as we head for our evening camp. After hearty lunches and thrilling rapids, we may stop to hike. Outlaw history abounds in this remote part of the Green River, we may check out an abandoned ranch where Butch Cassidy’s Wild Bunch spent their evenings. We will encounter 40 million years of geologic time as we float through this deep canyon. The canyon walls will soar up to the sky above you, at points Desolation Canyon is deeper than the Grand Canyon at the Bright Angel Trail. During the evenings, we will make camp on beaches or cottonwood groves that likely allow access to great hiking trails. If our guides don’t arrange a hike, you may want to enjoy a self-guided walk, or perhaps you’d rather just relax and wait for dinner — always a trip highlight, as the day’s adventures stir up a hearty appetite. The group dynamic of our trip is at its best as we gather around the camp “living room” for nighttime conversation and laughter. The whitewater increases with each passing day through the canyon. You will encounter the three most thrilling rapids, BelknapFalls , Three Fords and Coal Creek on this second half of your adventure. After a handful of more fun, splashy rapids and one last delicious lunch, our trip will come to an end at Swasey’s Boat Ramp. After saying goodbyes to your guides and taking a few last minute group photos, we will board a shuttle back to Moab, Utah. Wetsuit–weather dependent and by request (does not include footwear of any kind, including wetsuit booties). For clients with a high interest in using the inflatable kayaks, we will bring a limited supply of wetsuits. If you have your own, please feel free to bring it with you. Single Tent: We provide 2-person tents. It is assumed you will share this tent with another person. You can (if you prefer) have a tent to yourself for an additional charge of $30 per tent. The day before your trip we will meet at 7:00 PM in the lobby of Gonzo Inn, in Moab for a pre-trip meeting. Your trip leader will provide a thorough trip orientation and pass out your waterproof bags so you can pack your belongings that evening. The trip leader will also reconfirm the meeting time for the following morning and give you an opportunity to ask any last-minute questions. Your return time to Moab will be between 4:30 – 5:30 PM. This section of the Green River offers splashy Class II-III rapids. You will encounter more than 50 rapids along with calm stretches that inspire swimming, watching wildlife or just gazing at the breathtaking canyon scenery. This scenic stretch of the Green is ideal for first-time rafters and children as young as 7, but not short on excitement for more seasoned boaters. Each day varies, but on an average you’ll spend 4-6 hours a day on the boats. The rest of the time will be spent hiking and exploring, eating, or just relaxing in camp. While we generally plan at least three guided hikes on each trip, there is ample opportunity for the curious to explore the area at length. Please let your trip leader know if you are an avid hiker and remember to bring extra water bottles and good shoes. Remember however, that all hikes are optional and you can choose to lie on the beach and take in a few tanning rays or read a book instead. Lastly, the Trip Leader must consider to overall ability of the group when deciding what hikes to offer. Fishing is permitted on the Green River through Desolation Canyon. Dependent upon the campsite, you may be able to fish in the evenings or early morning. You will be required to have a Utah fishing license which can be obtained at www.wildlife.utah.gov/fishing/. You will need to bring your own fishing gear. Please bring your rod in a protective hard case. *The use of drones is prohibited by the Bureau of Land Management in Desolation Canyon. The Green River’s headwaters lie in the Wind River Range of Wyoming, and its stream is repeatedly blocked and diverted, most sizably by the Flaming Gorge Reservoir, not far upstream from Dinosaur National Monument. 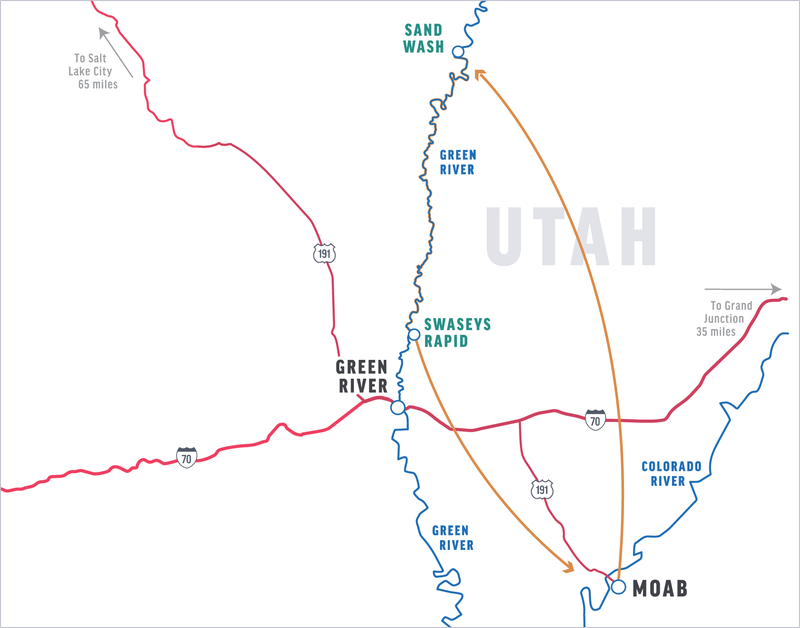 Thus, its flow is determined primarily by reservoir releases, although the Yampa River’s natural flows in the spring impact the Green River greatly as well. The Green River continues on until the confluence with the Colorado River. The flow of the Colorado River through Cataract Canyon is generally unregulated, meaning no single reservoir controls the water level. Peak run-off through Desolation Canyon usually occurs between mid-May and mid-June, but can vary widely from early May and into July. High water trips equate to a more intense whitewater experience and a high level of physical fitness is recommended. Water temperatures are coldest during the high water period and rain gear and warm synthetic clothing will be required. May and early-June Trips: These are surely some of the most beautiful months to be on the Green and Colorado Rivers, but they can also produce some surprisingly chilly times. During the spring, the sun is not far enough north in the sky for its warming rays to reach down into the river canyon for as many hours a day as it does in the summer. This means more shady areas, fewer sunny ones. Therefore, when you are splashed (drenched) going through the rapids and you’re in a shady area, you will get very cold unless you are prepared.